Theses handmade brocade silk table runners gives an authentic look to your dining table or kitchen table. These table runners are crafted by expert and hereditary artisans of Banaras in north India on handlooms. 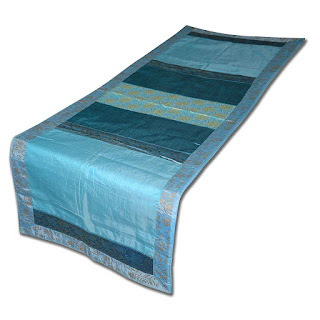 The elegant designs and patterns of these table runners makes them very attractive. Mostly the top of these table runners are made in brocade style silk and the bottom layer is made in cotton fabric or poly-silk. The main advantage of creating a table runner by hand is, it gives the vast choice of fabrics, patterns and designs for weaving & crafting an elegant table runner. Decorate you dining room by using these luxurious runners in various designs & patterns. It gives a traditional look to your dining room with modern style.